"When teachers have to buy their own supplies and equipment due to the poor economy, we need good value and prices. 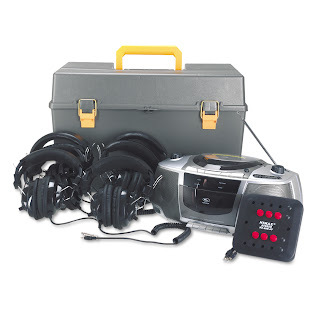 This listening station is just the right thing for my classroom. It works well, the price was wonderful, and it came in such a short amount of time, I was able to begin using it right away. I have always had excellent results when ordering from Amazon, whether it be items for my classroom or personal items. Keep up the good work." Tough plastic polypropylene lockable carrying case. FAQ -- What is the Voice Priority Feature?